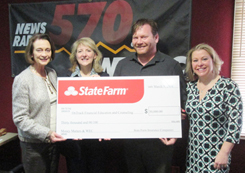 State Farm announced a $30,000 grant for OnTrack WNC Financial Education & Counseling which will support the agency’s weekly radio program, Money Matters, the Women’s Financial Empowerment Center and the annual Financial Literacy Awards Luncheon. The State Farm Good Neighbor Citizenship grants fund programs that build safer, stronger, and better educated communities. OnTrack WNC’s first State Farm Good Neighbor Citizenship Grant was in 2010 to support the weekly Money Matters radio program. In 2013, State Farm expanded its support to include the Women’s Financial Empowerment Center. In the last six years, the weekly listenership for the Money Matters radio show has grown from 2,200 to 4,900. The Women’s Financial Empowerment Center has served over 2,600 women throughout western N.C.